Since her high-profile divorce from Nicholas Tse (謝霆锋) in 2011, Cecilia Cheung (張柏芝) had custody of their sons, 11-year-old Lucas and 8-year-old Quintus. Nicholas kept a cordial relationship with Cecilia and was spotted recently visiting them in Hong Kong. 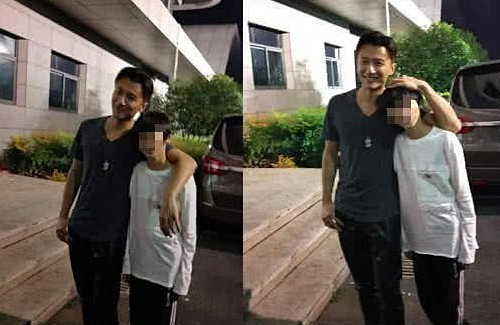 In the photos circulating online, Nicholas is seen posing cheerfully with Lucas. Upon seeing that Lucas has now reached the height of his shoulders since their last meetup, Nicholas is all smiles, touching him affectionately on the head. The photos ignited excited discussions by netizens, as it has been a long time since the public has seen Nicholas with his sons. Over a year ago, Nicholas had celebrated Quintus’ birthday with a party at home. Some netizens expressed delight that their elder son, whose charming good looks are often compared with young Nicholas, has already grown so tall, while others are curious as to whether the father-son photograph was taken by Cecilia herself. Since the split, Cecilia has been generously sharing photos of herself with Lucas and Quintus sightseeing in different locations, including Beijing and Singapore where they visited Universal Studios Singapore theme park in February 2017. However, a last check revealed that the actress’s Instagram account (with 218k followers) has now been set to private. Looks like Lucas going to get more taller since he’s almost taller than his dad and I thought we already know how their sons look like so not sure why it’s covered the face. Lucas does looks so much like his dad but for some reason looks like his dad did something to his face like had some tan done because I remember his skin are light now it’s a little tan to it.